From the south exit of Higashi-Okazaki station. About 7 min. on foot. ・By taxi : About 7 min. ・By bus : Take Tatsumigaoka-jyunkan, which departs from No11 bus station, and get off at Tatsumi-kita-1chome (about 6min), and walk to the east for about 3min..
・On foot : About 20 min. Okazaki-city lies 40 km southeast of Nagoya (which is located between Tokyo and Osaka). The nearest railway station is Higashi-Okazaki station of Meitetsu line running between Toyohashi and Nagoya, both of which are JR (Japan Railways) Shinkansen stations. 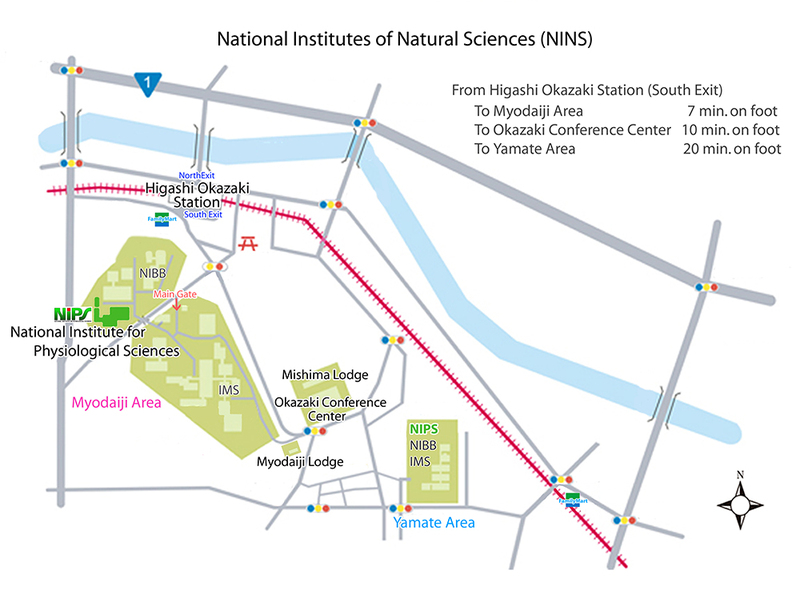 National Institute for Physiological Sciences (Myodaiji Area) is located on a small hill at the back of Higashi-Okazaki station; 7 min walk from the station to the south. A shuttle bus bound for Central Japan International Airport also departs from Higashi-Okazaki station. There are three ways to reach Higashi-Okazaki station. Get on the Meitetsu Airport Bus bound for Okazaki Station and get off at Higashi Okazaki Station (approximately 65 minutes from the airport). NIPS is a 7-minute walk up the hill on the south side of the station. Take the Meitetsu train from Central Japan International Airport to Higashi Okazaki Station. NIPS is a 7-minute walk up the hill on the south side of the station. Take the JR Narita Express airport shuttle train from Narita to Tokyo Station (approximately 60 minutes) and change trains to the Tokaido shinkansen* (bullet train). At Toyohashi JR Station (approximately 2.5 hours from Tokyo), change trains to the Meitetsu Line's Limited Express train** bound for Gifu. Get off at Higashi Okazaki Station (approximately 20 minutes from Toyohashi). Turn left (south) at the ticket gate and exit the station. NIPS is a 7-minute walk up the hill. *Note: There are three types of shinkansen: Nozomi, Hikari, and Kodama. Please make sure you take a Hikari shinkansen (sometimes stops at Toyohashi Station) or a Kodama shinkansen (regularly stops at Toyohashi Station). The Nozomi shinkansen does not stop at Toyohashi Station. **Note: Japan Rail (JR) and Meitetsu are two separate train lines, though both are accessed through the same station building. You will need to buy a separate ticket in order to travel on the Meitetsu train. Note that if you have a JR pass which was purchased overseas, you cannot use it for the Meitetsu line (although you can use it for the Narita Express and the shinkansen portions of your trip). Take the JR Haruka airport shuttle train from Kansai Airport to Shin-Osaka Station (approximately 45 minutes) and change to a Tokyo-bound Tokaido shinkansen* (bullet train). At JR Nagoya Station (approximately one hour from Shin-Osaka Station), change to the Meitetsu Line's Toyohashi-bound Limited Express train. Get off at Higashi Okazaki Station (approximately 30 minutes from Nagoya). Turn left (south) at the ticket gate and exit the station. NIPS is a 7-minute walk up the hill. *Note: All Tokyo-bound Tokaido shinkansen trains stop at Nagoya. Take the Tomei Expressway to the Okazaki Exit. Turn left at the Fukiyabashi-kita intersection (approximately 10 minutes from the exit).